After rigorous counselling studies, publishing four books, volunteering as a speaker for Beyond Blue and manning the phones at Lifeline, I happily accepted a position on the National Dementia Helpline in January 2016, and what an adventure it has been! 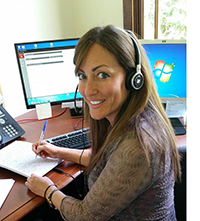 Being a Helpline advisor is as unpredictable as it is challenging and rewarding. Calls range from disseminating information to assisting those who are experiencing out-and-out crisis. The latter are usually family members struggling to come to terms with a diagnosis or unexpected, volatile behaviours that have left them blindsided, afraid, confused and panic-stricken. Some calls come from those in high states of distress. Many come from gorgeous, elderly people who hail from a golden age where ideals such as gratitude, kindness, courtesy, good humour and standing by loved ones prevailed, no matter what. The National Dementia Helpline speaks to families in conflict. We speak to those in remote parts of the country left feeling isolated, alone and scared. We do our best to unravel the knots surrounding capacity and legal issues. We speak to sons, daughters, husbands, wives, in-laws, siblings, friends, carers and health workers alike. We speak to those who have been diagnosed with dementia who appreciate the opportunity to simply share their stories. It’s not an easy task to provide a day-in-the life snapshot of a Helpline advisor as we never quite know what to expect. I’ve organised emergency interventions, yet I’ve also organised a birthday reunion between two 100-year-old good time gals! I’ve cried alongside people as they’ve shared with me their grief. I’ve attempted to help track down those who have wandered. And I’ve also laughed uproariously alongside hundreds of callers! Being on the coal face, we on the National Dementia Helpline do our best to offer some semblance of order to an illness that defies logic. And despite being unable to reverse that which is irreversible, nearly all of our calls close with hope, greater insight and appreciation. It seems that people being meet halfway by a sympathetic ear, calm voice and extended hand, albeit over the phone, assists exponentially. So, a day in the life of a helpline advisor is unpredictable and draws upon many skills – listening, empathising, educating; “holding” the many who need holding; plugging people into our myriad of wonderful services and into the more-than-capable hands of our colleagues nationwide; and, of course, navigating our beloved TCM! It was around this time last year that a saturated advertising campaign hit the airwaves and we on the Helpline hit the ground running. We haven’t stopped since. Yes, our job is demanding, but being invited into people’s lives during their hours of need is an honour. I personally believe that the reason we’re all here on this wacky planet of ours is to look out for one another, so to have work in a job that enables me to do just that at the same time as being surrounded by other beautiful advisors is an absolute blessing. emotional support to help you manage the impact of dementia. Anyone who is interested in dementia, is concerned about their memory, has been diagnosed with dementia, works with people with dementia or simply wants to know more can contact the National Dementia Helpline via phone, email or webchat. 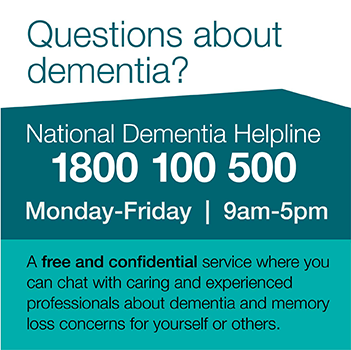 The National Dementia Helpline is available from Monday to Friday, 9am to 5pm and can be contacted by phone on 1800 100 500, via email at helpline.nat@dementia.org.au or via webchat at www.dementia.org.au/helpline/webchat . You can also leave a message asking for a call back. All of our services are private and confidential. Personal information will not be shared without your consent (unless required by law).